For as long as I can remember, I've had a fascination with reading and watching documentaries about serial killers and true crime stories. It's always been interesting to me, the minds of the people that can commit such unspeakable acts of violence, and also serves as a reminder to me that there are people to be wary of in every day life. 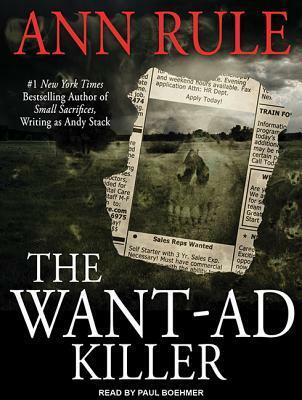 When this book popped up for my library's True Crime Tuesday, I knew I had to listen to it. I had never previously heard of Harvey Louis Carignan or the "Want-Ad Killer" so I was curious about who he was and what he had done. It's safe to say that he was one messed up dude. The crimes that he commited were unbelievable and the man himself was ridiculously disgusting and vile. He would literally marry women that had teenage daughters because he was into teen girls. How freaking terrible is that? Although his story was interesting, it makes me sad to know that there are people out there that commit such heinous crimes and I feel so bad for all the poor women that he violated, murdered, and ruined.